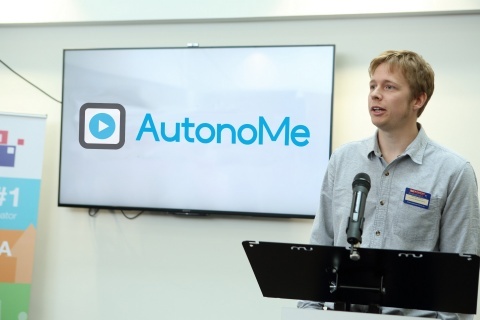 Bristol SETsquared member, AutonoMe, is set to further develop its innovative products that help people with learning disabilities and other cognitive impairments following a funding injection from Bristol Private Equity Club. AutonoMe a support system that combines the power of video and mobile technology to help people with learning difficulties through everyday tasks. Users can access videos that show them tasks such as making a cup of coffee or loading a dishwasher or using a washing machine through their mobile phone or iPad simply by scanning household items. The firm has secured £150,000 of funding to help it develop the product, which was incubated with SETsquared in Bristol, through which the founders were introduced to Bristol Private Equity Club. Jerry Barnes of Bristol Private Equity Club said: “This is exactly the sort of business that our private equity club, which now has 41 members, is looking to help. There is a lot of financial support available for start-ups and there is Angel Funding for those needing bigger injections of capital, but there is a gap at this level for growing businesses which we aim to fill. “We have successful entrepreneurs with some spare capital who want to support businesses in the Bristol and Bath areas. As well as being a source of funds we have a tremendous pool of talent with experience that can help businesses grow. “The club was founded in May 2016 with just six investor/members and it has grown tremendously as we look for projects which need between £100,000 to £500,000 of equity funding, where our members can make a real difference and enjoy a return. William Britton, founder and CEO of AutonoMe said: “To have the support of local business people is so much better than dealing with anonymous banks or funds in London. We have plans to add a variety of additional features to the product and recruit staff to support our expanding users and clients. “We have recently developed a number of partnerships, the largest being with Dorset Council and the security that the relationship with Bristol Private Equity Club has brought will enable us to deliver to them and to other partnerships with Devon, Hampshire and Southampton Councils. “AutonoMe came about in 2015 because after years of teaching as a lecturer and Assistive Technology specialist for students with learning disabilities I became increasingly frustrated at the lack of cost effective, 21st century mobile technology available on the market”.